Gosh it does feel good to be able to type again. In fact, just move more than an inch without winching in great pain. You've probably noticed for the last week I've been radio silent. No blog posts, no tweets, no instagram. That's because last Sunday afternoon I suddenly got severe pains in my stomach. It came in waves, with a sort of base pain, with random bouts of sudden stabbing like pains ripping my stomach. I felt sick, I was shivering, I couldn't lie down- I was just in so much pain. On Monday I went to the doctors as the pain had calmed to a dull pain with again stabbing pains every so often, however by Tuesday morning I was screaming in pain. It felt like my stomach was being ripped out. I had appendicitis and needed surgery to remove it immediately. So for the last week I've been in hospital and recovering. This last week I've never felt more ill. Not being able to move for the blinding pain, and the waves of sickness. I tried to write this earlier, but had to grab a bin a few times. 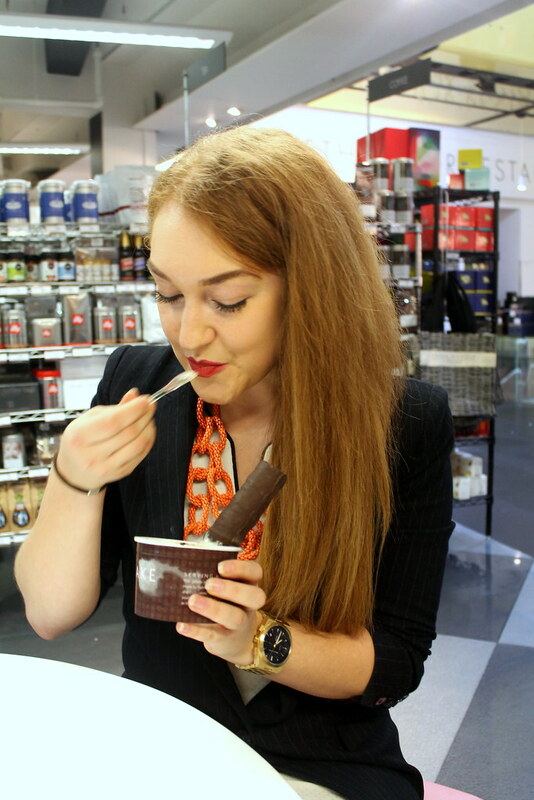 Thankfully I'm now able to sit up, and type again so I thought I'd fire back up the blog from my bed and write a short post to get back into things, which in the spirit of my current state, it was only fitting to write about ice cream- the king of recovery fuel. 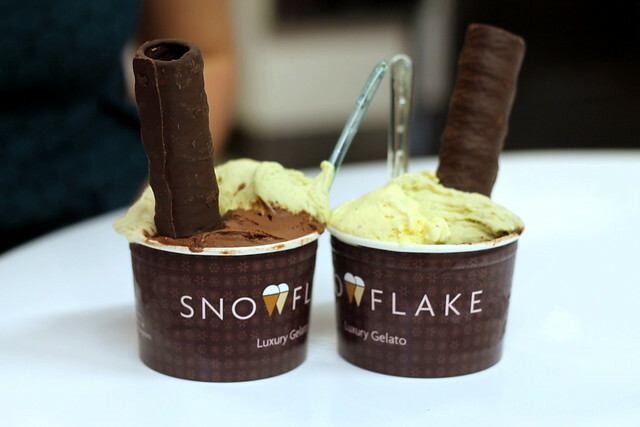 Just before I fell ill, me and Ness swung by Sno Flake, the award winning gelato, for a bit of a naughty treat. They are the winner of no less than 18 gold star in the Great Taste Awards and won supreme champion in the 2014 awards. That's one good ice cream. 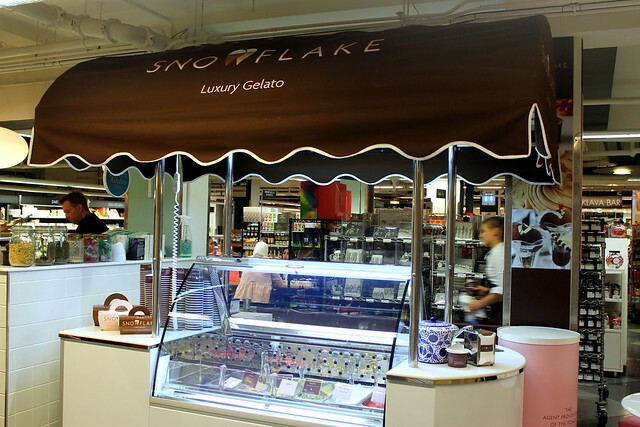 Based in Bayswater and Soho, they had a pop up at Harvey Nichols which only served their award winning flavours. Being a greedy cow- well seeing as this last week I've barely ate, I think it all balances out rather well now- we had 3 scoops each. Dark Chocolate, Date and Honey and Pistachio. 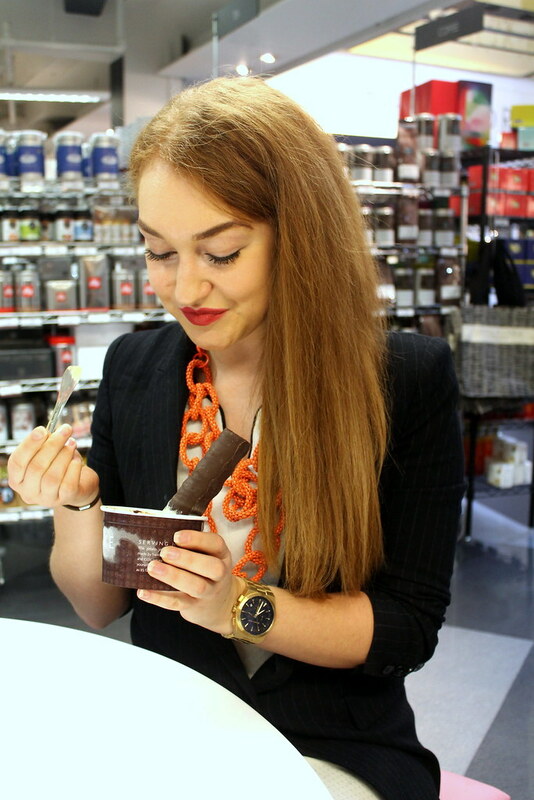 Uber thick, luxurious, tantalising- it's a bit like soft silk rolling around your tongue. I don't claim to be an ice cream connoisseur, but this blows Ben and Jerrys out of the water by a mile. 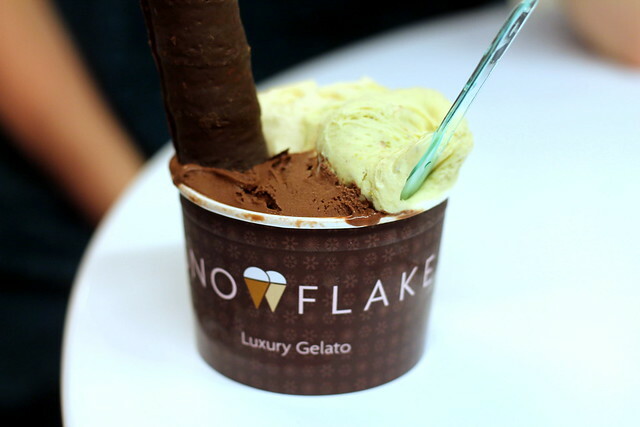 This blows several London gelato places I've been to clean out of the water too. God I wish I had some of this now. No matter now sick I feel, I'm sure I could finish this pot clean off. I've got a few exciting things I need to tell you all about, so expect me to be back on the blog now and hopefully I'll be back out and about soon enough. 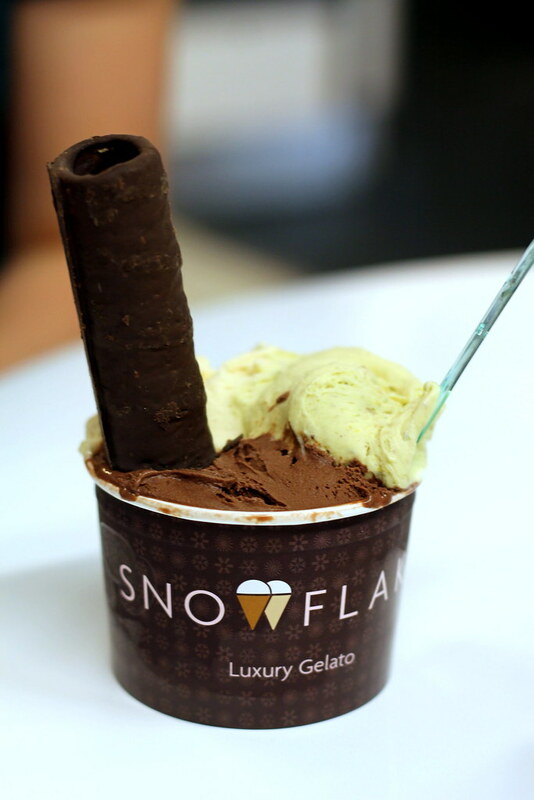 In the mean time, send me Sno Flak ice cream to my bedside please? 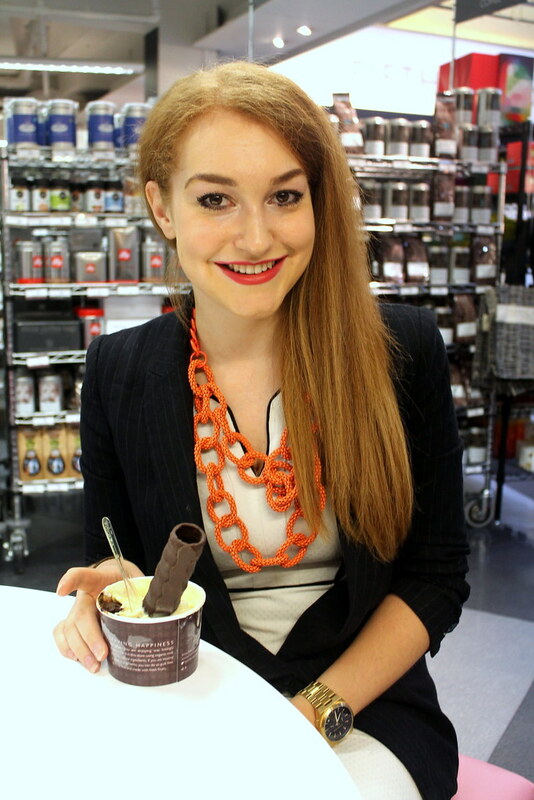 Sorry to hear you've been ill; get well soon and make sure you pamper yourself to bits =) you'll be up and eating ice cream again in no time! Oh you poor thing, Appendicitis is the devil. Hope you feel much, much better soon. And that some kind soul delivers you some of that badass looking ice-cream!! Oh my gosh! I wondered why you were so quiet! I hope you get better really really soon! I can't wait to see more adventures! 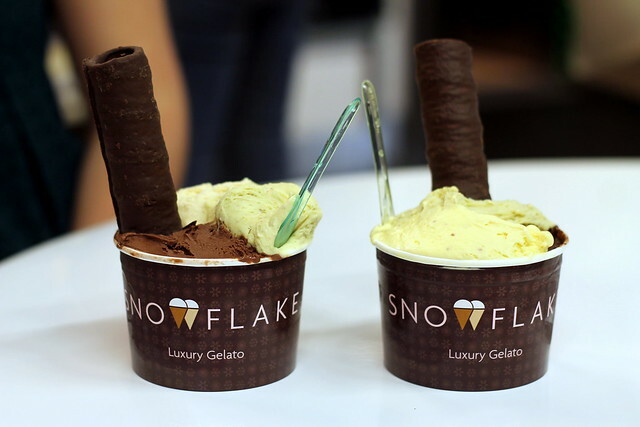 Yummmmmm, those ice creams look absolutely AMAZING! Glad you're feeling better now lovely. Been worried about you, but had a few updates from Caroline! Glad to hear you're on the mend! We've missed you! Also, I need ice cream right this second. Yum.